On the Configure step of the course editor you can adjust a few course settings options (i.e., scoring of content pages) and set a mastery score per section. Mastery score means that to pass a course successfully, learners have to reach this score (in our case it’s 80%) per each section of the course. This score can be seen on the progress bar under each section icon. Cross-device progress saving can be enabled on the Configure step, under General settings. Note: Cross-device progress saving is available in the Simple course only. If the option is on, learners will be asked to authorize via social media or using their email. If a learner decides to take a break and complete the course later, they just need to press the Take a break button. Learners can continue with the course at any time from any device with an internet connection. To start the course where you left off, click on the secret link – this link will be sent to your email. Alternatively, you can login in the same way you did the first time, but you will be asked for a password that is also sent to your email. One and the same password will be used for all your courses. Note: A password is sent only once. You can reset password via Forgot password link. On the Configure step of the course editor, you can set up General settings. General course settings differ depending on a course template, and they are only available for Simple and Test/Assessment templates. 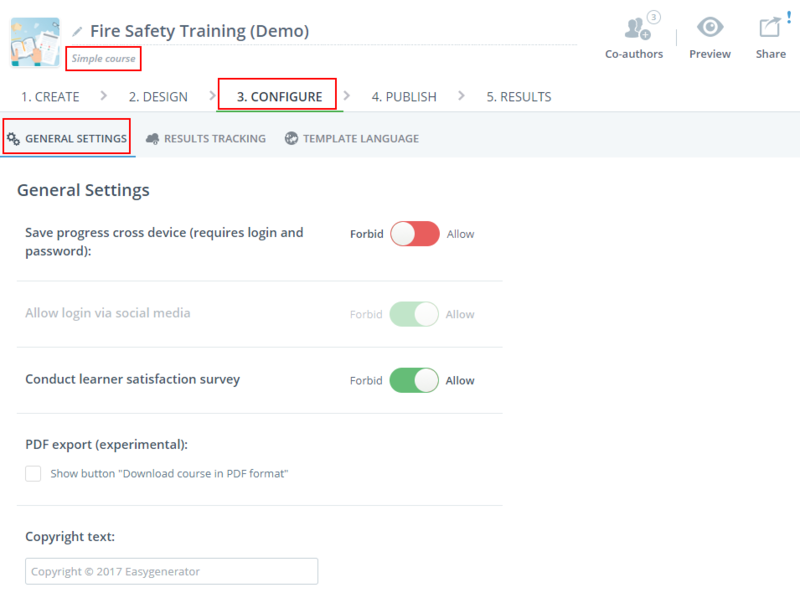 In the Simple course template, you can enable cross-device progress saving, login via social media, learner satisfaction survey, PDF export, and add copyright text. Cross-device progress saving allows learners to take a break and continue passing a course later on any device with the Internet connection. Learn more. Learner satisfaction survey allows measuring whether your learners are content with a course or not. Learn more. PDF export allows downloading a course as PDF. Run your course via the share link (it won’t work in the preview mode), and in the top left corner, you’ll see Download as PDF button. Copyright text will be displayed on each page of your course. 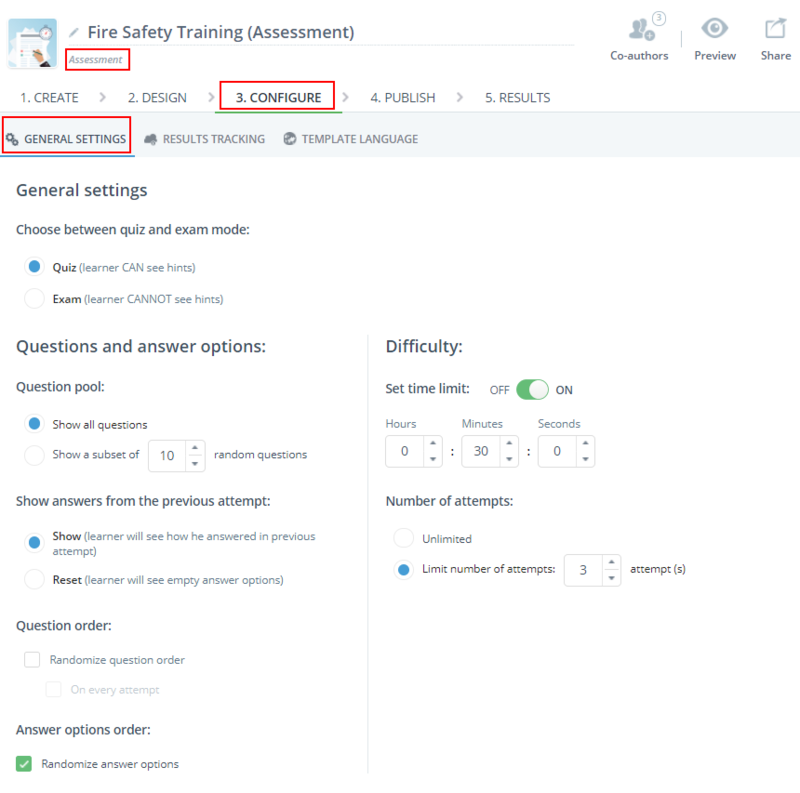 In the Test/Assessment template, you can choose between Quiz (a learner can see hints or learning content added to questions) and Exam (a learner can’t see hints) modes. Question pool. You can choose whether to show all questions available in the course to a learner or a certain subset of random questions. Question order. You can randomize the order of questions (on every attempt). Show answers from the previous attempt. You can choose whether to show or reset answers from the previous attempt. Set time limit. Use this option to set a specific time limit that a user will have to complete the course. The timer will be shown in the top right corner of the screen. Number of attempts. You can set a certain number of attempts or allow an unlimited number of attempts. On the Configure step of the course editor under Template language you can choose the language for your course. All text items that are present in the course template interface (texts of the buttons, titles and headings, field names, error messages, validation messages, etc.) can be also translated into a different language. In the language dropdown select Custom. In the Translation column you can replace the default text items of the course template interface that are in English with the translated ones.